The UK branch of the TV channel Russia Today (RT) last week received a letter from NatWest, saying its credit facilities were being withdrawn. Margarita Simonyan, RT’s editor-in-chief, cast the NatWest move as an attack on free speech. “We have no idea why it happened, because neither yesterday nor the day before yesterday, nor a month ago, nothing special happened to us, nobody threatened us in any way,” she said. 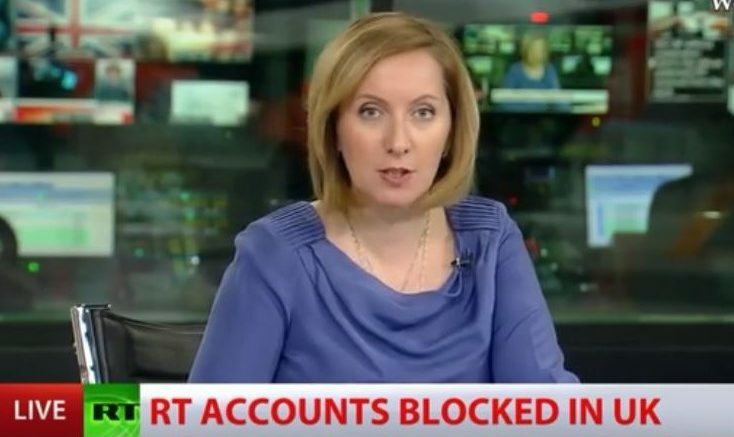 This has followed sanctions by Ofcom, the communications regulator, for biased reporting of both the Syria and Ukraine conflicts, the blocking of transactions by the UK branch of Spanish bank BBVA, questions in the House of Commons about RT’s propaganda potency and a running criticism from mainstream media pundits. The Guardian’s Nick Cohen has described the station as a “channel whose political line follows the Kremlin line with puppyish eagerness”. David Remnick of The New Yorker has perceived a “resentment of western superiority and resentment of western moralism”. The station contends this antagonism is proof that the truth can hurt. It cites its coverage of UK involvement in Yemen, government plans for fracking, its coverage of Wikileaks’ Julian Assange and the voice it gives to minority groups. Jean Baudrillard, the French media theorist, will no doubt have chuckled – and fumed – over these events from his perch in the heavens. Baudrillard developed ideas about simulated versions of reality – or hyper-reality –propagated through consumerism and the media. As global societies try to form a coherent picture of human life, he suggested, the more insecure and unstable it looks, then the more fearful those societies become. RT, a state-backed broadcaster, was set up a decade ago to bolster the country’s image, and “break the Anglo-Saxon monopoly on global information streams”, according to Russian President Vladimir Putin. Although Royal Bank of Scotland, which owns NatWest, quickly withdrew its punitive action – after Russia threatened to freeze the BBC’s finances in Moscow – the station equally quickly became the focus of worldwide attention amid an “attack on free expression”. The result is that another large bank has become vilified – a favourite news item on RT. Maria Zakharova, from the Russian foreign ministry, wrote on Facebook: “It looks like, as it leaves the EU, London has decided to leave behind all its obligations towards freedom of speech. As they say, best to start a new life without bad habits”. Russia Today employs an array of debates, chat shows, market commentary and documentary to shine a light – albeit one filtered through the eyes of the Kremlin – on issues ranging from arms exports to conspiracy theory and fringe economic models. Presenters such as Max Keiser, Larry King and Abby Martin have jazzed up a medium that had drifted between staid and morose to vapid and infantile. Since the emergence of the internet, and its profusion of narratives, the diversity of opinion has caused the mainstream media to appear monolithic and collusive. For London-based news editors, at least, the BBC acts as the template for that “safe” agenda. This may partially explain the mutiny among readers and viewers from traditional outlets, and explain the growing popularity of a foreign station such as RT – it exists outside that box. Those proprietors attempting to limit the plurality of the coverage of events might take a leaf out of Baudrillard’s book, and read the signs of public mood. The NatWest episode generated enough free coverage for RT to counter any number of advertising bans. With a funding base similar to Fox News, RT now has 35 million viewers daily (with about 2.5 million in the UK) and is one of the top five news channels in Europe and the US, according to polling agency Ipsos.